The portraits are part of an ongoing project: the exploration of the human face. 2002 faces - the initial series, was displayed collectively only once in 2002 as a homage to time, measured in years, from its origin to present day in the Western World. For every year, there was one portrait. Since the completion of 2002 faces, many consecutive series evolved. They diversified in media and size, and include sculpture as of 2004. Shown are not portraits of actual people, but of fictitious characters. The face as the-mirror-of-our-soul allows a seemingly endless variety of expressions. 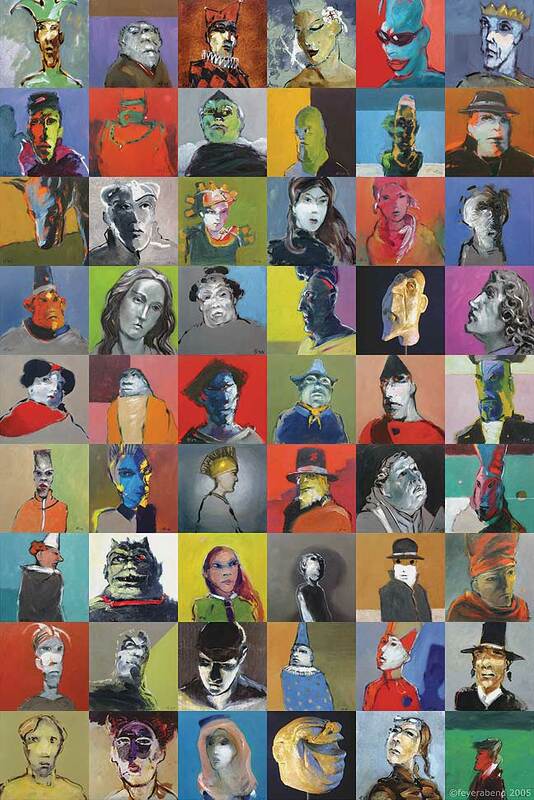 One key element of these faces is the invitation to interactivity: selecting one or more paintings, the investor creates his or her own unique composition. With the option of grouping the individual paintings in clusters, new relationships between single characters are formed. An option for large scale works with a strong overall visual impact emerges. 2002 faces one time art installation by Hans Feyerabend, December 2002 (Pictures of the opening reception: Friday, December 6, at 7pm, Music by DJ James Brian at Gallery Vincent, Coconut Grove, FL). Over 1000 select portraits from the 2002 faces series were on display at this one time multimedia installation at Gallery Vincent in Coconut Grove, accompanied by slide projections, music, and 3-dimensional work. The core of the work are 9" x 9" oil and acrylic on canvas- and cardboard portraits, mounted on panels and assembled in a 20’ x 30’ installation in the main room of the Gallery. Other prortraits from the 2002 faces series are in show locations throughout Miami, Berlin, Germany and in various private collections in Florida.